**Rhoelyn:** “You know the last place they were, so we can start there. Now let’s see about transport…” Verune places a hand on Nysse’s back, guiding her. **Araatris:** Before long, they wing on a trio of hippogryphs over the forests of Val’sharah and around the foul, deep scar in the land that is Felsoul Hold. **Rhoelyn:** Nysse guides them to the outcropping and lands the hippogryph. “They’ll have moved, but I hope we can tell where.” Her gaze studies the ground. **Araatris:** All them are grim with the story of violence that the clifftop clearing tells. Blood splatters and scorch marks. Hoof and boot and pawprints. **Araatris:** His answer is a whisper of magic as he shifts into a dusty grey cat, his violet tattoos clear on his shoulders. He sniffs about before looking east. **Araatris:** He moves off with little warning, padding quietly towards the treeline farther from the cliff’s edge. In the shadows, he nearly disappears. **Rhoelyn:** The huntress glances over her shoulder and Celara nods, releasing the hippogryphs to return. They follow Verune in the dark forest. **Araatris:** Here and there, they discover boot prints and bloodstains. After a while, his senses lead them toward an area where the trees thin to another cliff. **Araatris:** The huntress nods. “That’s Tsume,” she whispers back with no doubt. Still, they all continue carefully, wary as they reach the edge of the trees. **Rhoelyn:** The feline druid leans left while Nysse cautiously peers out from a tree. Something catches on her arm, yanking her into the open with a sharp gasp. **Araatris:** “You’re not sneaking up on us again, nightborn!” She sees the knife first, shoved practically in her face as the familiar voice growls at her. **Rhoelyn:** “K-kaerryn!” The night elf presses against the tree, covering her belly protectively. The warrior blinks then curses, lowering her knife. **Rhoelyn:** The huntress blushes. “We didn’t know if you were alone or captive, Kaer. Mama and Verune came with me.” She looks over the human’s shoulder. **Rhoelyn:** Nysse stares at them in confusion. “I… did I miss something?” Celara steps past her daughter and heads toward Sarren. Nysse barely notices. **Rhoelyn:** Verune raises an eyebrow and lets her tug him with her. “Kaerryn, dare I ask why you’re so happy to see me?” Nysse frowns, following. **Rhoelyn:** Nysse’s eyes widen and she gasps, jogging to catch up. “Who’s hurt, Kaerryn?” The warrior glances over her shoulder at the huntress. **Rhoelyn:** The huntress frowns worriedly. “I’ll help.” They enter and head to the back of the cave. Nysse slips past to Relare while Verune checks on Leo. **Araatris:** Amidst the gentle glow of the druid’s verdant magic, Relare’s pallor looks worse, the sickly dark circles under his eyes deeper. He’s barely lucid. **Rhoelyn:** The night elven woman kneels by Relare and takes his hand. “Don’t worry. Verune’s here. He’ll heal you in just a moment.” She smiles weakly. **Araatris:** His emerald eyes slide to her, but with the comprehension of someone stuck in a feverish delirium. Despite being out of his armor, he’s sweating. **Araatris:** After a while in which he closes his eyes and seems to drift off to sleep, Verune and Kaerryn approach. “What is this?” the druid asks, grim. **Rhoelyn:** “Fel infection.” Kaerryn grimaces. “Nasty one, too.” Nysse murmurs, “He’s really feverish.” The elder elf settles on the other side of Relare. **Rhoelyn:** Kaerryn crouches and nudges Nysse. “Unbutton his shirt. An oversized eredar tried to gut him with his claws, but…” Nysse blushes, but complies. **Araatris:** Nysse nods and scrambles to her feet, glad to step away. She instead turns to Leo, who rests on his side not far away, tucked in a blanket. **Rhoelyn:** “At least you still have your looks?” Nysse offers with a small grin. “Ah yes, I suppose I should count my blessings.” Leo dryly comments. **Rhoelyn:** The huntress follows his gaze and speaks softly. “He’ll be alright, Leo. We won’t let you lose him again.” She rests a hand on his shoulder. **Araatris:** He jerks physically at how spot-on her words are to his worries, his green eyes wide before he looks away, resting his sleeve over his face. **Rhoelyn:** Her hands drop into her lap and she smiles sadly. “I thought as much… I feel like I’m back where I started.” Her breath catches, and she looks away. **Rhoelyn:** The huntress reaches over and tucks him in. “Of course. Rest well.” Out of habit, she kisses the top of his golden head like she does for Yami. **Rhoelyn:** Flushing, she looks away. “H-hush! It was a one time thing to help you sleep.” Despite her words, an embarrassed grin plays at her lips. **Araatris:** “Better,” the druid rumbles, his gaze distant. His magic still glows softly against the paladin’s skin, but the ugly infection is much clearer. **Rhoelyn:** Knowing it’s better to give him silence to work, the young woman takes Relare’s hand and hopes that she can at least grant the sin’dorei comfort. **Araatris:** Kaerryn eyeballs them from afar as he works, but both times the loud redhead tries to make her way over, Sarren and Celara distract her. **Rhoelyn:** “You both know she’s over there blaming herself for their injuries! That dummy always blames herself even when she shouldn’t,” Kaerryn rants. **Araatris:** The couple watches as the human settles down by the mouth of the cave, a transparently protective position. They exchange knowing grins. **Rhoelyn:** The demon huntress smiles. “I hope you don’t mind if I get to the point, but Rhian and Yami are waiting.” She explains the current situation. 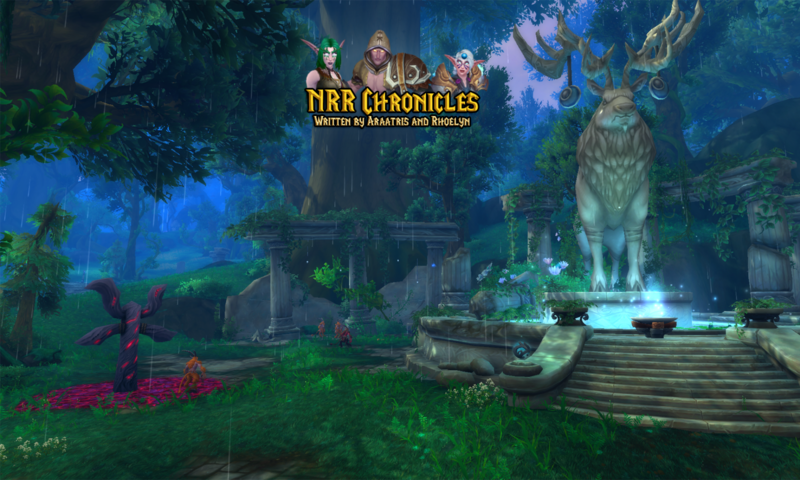 **Araatris:** As if on cue, the elder druid approaches them, rumbling, “I heard my name.” He glances back one last time at where Nysse comforts Relare. **Rhoelyn:** “It’s nice to meet one of the two demon hunters she’s mentioned. Now what’s this about Yami? Did you find him?” The druid scratches his chin. **Araatris:** Mirra tilts her head. “Dorian? Hm. It all sounds friendly enough. But whoever orchestrated this isn’t playing nice.” She gestures at the sin’dorei. **Araatris:** (c) But I’d like to think he’ll behave for the boy. We should rest and leave in the morning, when we’re at full strength.” Sarren looks over at Nysse. **Rhoelyn:** “I’ll go break the news to her, so she has some time to sleep on it.” The hunter breaks away from the group, walking towards his daughter. **Araatris:** “Relare and Leothir are both exhausted, little star. There’s no danger of him waking while we talk,” her father says, resting his hand on her arm. **Rhoelyn:** The huntress nods reluctantly, glancing at Relare one more time before she stands. Her father leads her to a side, away from the others. **Rhoelyn:** She clicks for Tsume and Sarren catches her arm. He repeats, “Yami has Rhian. He’ll be fine.” The huntress nods silently as the wolf noses her hand. **Araatris:** The elder hunter smiles. “That is all we can ever do, little star. We try.” He pats her shoulder before he turns and walks out of the cave. **Araatris:** Her loyal companion whorfles an agreement and nuzzles her, curling up into a sleepy, soft furball by her side. She rests her head on Nysse’s legs. **Rhoelyn:** Nysse muffles a giggle. “Yes, you silly pup, I’ll rub your ears.” Her fingers dig into the fluffy fur behind Tsume’s ears until she’s asleep.